Users can easily debug Node.js applications on the client side. The technology places the right source code breakpoints, sets watches, explores variables and call, and utilizes an interactive console. Seamless tool integration allows developers to maximize built-in linters, test runners, REST client, and other deeply integrated properties. Unit testing functionalities lets users debug tests run Mocha, Jest, Karma, and Protractor. Test statuses are instantly available both in a treeview or an editor. With WebStorm’s integration with VCS, developers can tap a simple unified UI to work with Git, GitHub, Mercurial, and more. Users can commit files, review changes and resolve conflicts with a visual tool integrated within the IDE. WebStorm’s intuitive editor can assess a project thoroughly in order to produce the best code completion results for all supported languages. Hundreds of integrated inspections flag any possible issues right as a user types, then suggests quick-fix options. These ensures the quality of a developed project. WebStorm has Navigation & Search fuctions that helps users get around a code more efficiently and quickly. One can jump to a method, function, or variable definition. This is specifically useful for developers who are working on large projects. WebStorm seamlessly integrates with top command line tools for web development. This delivers a streamlined development experience that increases productivity, without using the command line. Build tools are displayed in a simple unified UI for running Grunt, Gulp or npm tasks. Apart from WebStorm’s hundreds of own inspections, the technology can run ESLint, JSCS, TSLint, Stylelint, JSHint or JSLint against your code. WebStorm has a Local History feature that can inspect all actions and revert to previous versions. Developers can work on more programs with the help of WebStorm’s built-in templates. Aside from popular ones such as Express or Web starter kit, users can access more project generators with WebStorm’s integration with Yeoman. WebStorm is highly customizable as it can be adjusted to suit any type of developer’s coding style. Users can customize shortcuts, fonts and visual themes to tool windows and editor layout. 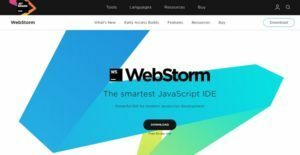 If you are interested in WebStorm it could also be sensible to analyze other subcategories of Best IDE Software gathered in our base of SaaS software reviews. Each business has its own characteristics, and may need a special IDE Software solution that will be designed for their business size, type of customers and employees and even individual niche they deal with. We advise you don't count on getting a perfect software that is going to work for each business no matter what their background is. It may be a good idea to read a few WebStorm reviews first and even then you should pay attention to what the solution is supposed to do for your business and your staff. Do you require a simple and intuitive solution with only basic features? Will you really use the advanced functionalities needed by pros and large enterprises? Are there any specific features that are especially practical for the industry you operate in? If you ask yourself these questions it will be much easier to locate a solid solution that will fit your budget. We realize that when you make a decision to buy IDE Software it’s important not only to see how experts evaluate it in their reviews, but also to find out if the real people and companies that buy it are actually satisfied with the product. That’s why we’ve created our behavior-based Customer Satisfaction Algorithm™ that gathers customer reviews, comments and WebStorm reviews across a wide range of social media sites. The data is then presented in an easy to digest form showing how many people had positive and negative experience with WebStorm. With that information at hand you should be equipped to make an informed buying decision that you won’t regret. What are WebStorm pricing details? What integrations are available for WebStorm?